On another note, have any of you guys been on a cruise? Last night B’s boss raved to us about a cruise they went on through Europe, and now all I can do is daydream about me laying out by a pool on a cruise ship finally reading Bossypants because I’m that behind the times. I went on one to Mexico when I was 12 years old which I didn’t find it that exciting, but one through Europe sounds like a dream. Getting to see magical places without having to think about anything like where you’ll stay or how you’ll get from one country to the next, no decisions to make, and getting to sit out by the water whenever you want. Someone tell me it’s real! My husband and I went on our first cruise (to Alaska) in August. It was really fun! Although, being on a ship for 7 days can get old after a few days. Of course we had time off the ship, too. I think we would do it again, but maybe for a shorter amount of time. So cute! I love it when I find an item of clothing I bought at Goodwill or something at a great price and it's actually in style/looks great : ) And I haven't even started Bossypants, but I loved Mindy Kaling's book! That top is super cute! I can't believe you've only worn it once…I can think of at least 10 potential outfits it would go with (ok, maybe that's my closet…but still) :). You should definitely wear it more! I went on a 3 day cruise to the Bahamas and loved it. My husband and I would love to go on an Alaskan cruise sometime. I tell people who haven't gone on a cruise before that if you are bored or hungry (on the cruise) it's your own fault! My husband and I went on our first cruise (to Alaska) in May/June. It was amazing. One of our top 2 favorite vacations. We did a Disney Cruise, and from what I hear, we will never want to do anything else. We don't have any kids, but that didn't matter. Plenty to do for adults and the service was top notch. 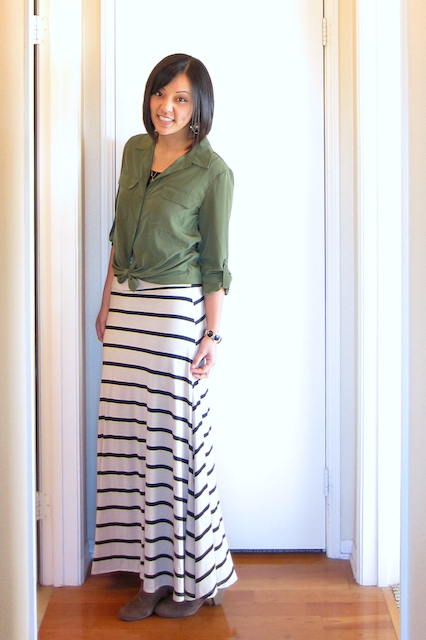 Love how your paired the olive top with the b+w- such a good color combo! I like that olive top, I feel like it would go great with your mustard cardi, or jeans and fun boots? That skirt is killer too! I've been on several cruises they are fun! I've never done a European cruise, but I've done the Caribbean and its great. You get to go to 2-3 islands then hop back on the boat and relax. Ive been on lots of cruises but my favorite was European cruise I took with my Mom (her 60th birthday present- my 40th) about 5 years ago. Amsterdam, Morocco, France, Belgium, Spain. It was awesome!! It was only a 7 day cruise and there was a ton to do on ship- or you could just chill on board. Only complaint was that you didn't have very much time in any destination (6 hours in Paris wahhhhhhhh!) But for us it gave the opportunity to decide where we liked (Belgium, France) where we didn't (Morocco) and we felt very safe being 2 women traveling overseas. I am starting a Go Chic account because I really feel I am missing out! Cruises can be amazing, like one to Alaska…completely recommend. I took one to Europe and I was not impressed. You take so much time to fly over there and then you are stuck on a boat and can only stay a few hours in port so you don't actually get to see much of the countries. Pretty much a bummer. If you are going to Europe go on a land tour to see the most you can. If you go on a cruise do it for the cruise alone and stay closer to home! Yes! I went on a cruise last year to Central America! It was pretty nice, but a European cruise sounds magnificent! I haven't been on a cruise, but it sounds like fun! If you ONLY knew how many things I have in my closet that I have only worn once…it would make you want to barf. It's BAD! Can't wait to see how else you style this top….get your $8 worth!!! 😉 And no cruises for me…I think I would be too claustrophobic in the rooms. I love this top with your skirt! I actually have the same top that I am guilty of not wearing enough. You've inspired me to put in rotation. Ha! Had no idea! Now I *really* wanna read it on a cruise. 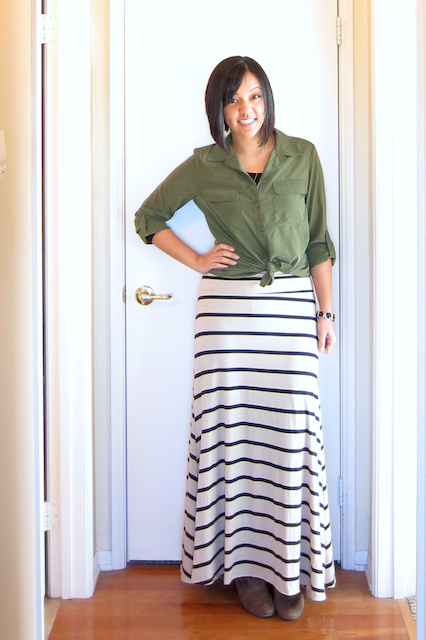 I love this olive top! Great that you can bring it back to life. Also – went on a cruise for my honeymoon, through Spain, France and Italy. It was AMAZING!! Saw so many things. Hope to do it again one day. I think it's really great you are trying new ways to wear pieces you haven't. And now you brought the price/wear down to $4. That's better than $8! I went on a 14 day mediterranean cruise (London, Portugal, Spain, Italy, France). It was AMAZING!!!! It allowed you to see so many things. Highly recommended. Good on you for making the most of a shopping mistake, or not, now! It's a smart outfit. 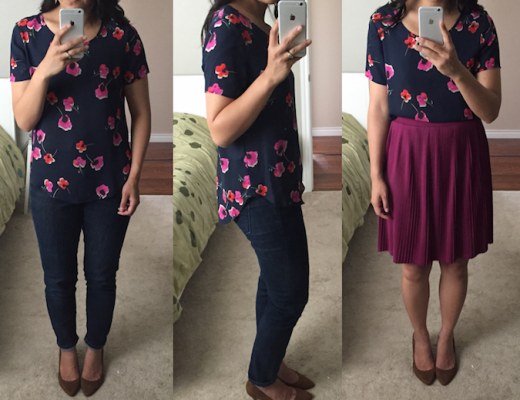 I'm feeling a little fashion-weary lately so your outfit combinations are nice to see. It's been recommended by enthusiastic friends that we try cruising too, so I'm interested to read what people say about it. Since you don't wear that top much, I think you should give it to me 😉 I've been wanting one like that for a while now. Looks great! You should definitely wear it more often! Good gravy I just discovered your blog tonight and am a wee bit smitten because (a) you give such helpful and practical suggestions (b) that include photos and (c) links to the featured products. You are my new hero. I also have an item or two, that, even though I never wore them much, I don't consider like a mistake and always keep for some reason. And then at some point, I figure out a way to make it work. Mediterranean cruise is amazing. Definitely do it and splurge a bit to make it worth it. I did Greece, Italy, and a bit of Turkey on celebrity cruise. Also love the olive blouse, glad it worked out. My husband was *just* researching a Mediterranean cruise instead of a European one. Sounded like an even better option for us, so I'm really glad you chimed in because now I've tipped over to that one. It sounds FANTASTIC! If you don't hold out until cruise time to experience Bossypants, I highly recommend the audio version! I don't usually focus well enough to listen to them, but Tina Fey reading was perfect–much funnier than I think it would have been if I was reading it in book form. I organized my desk while I listened, pausing, of course, to laugh (and run to the bathroom)! 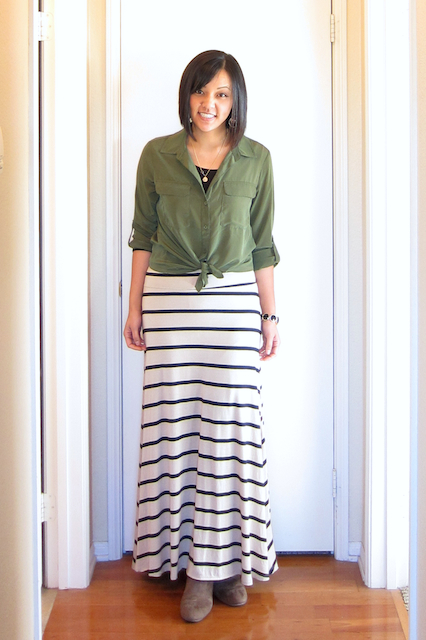 I need a striped maxi skirt in my wardrobe!